Meet Ken Runyon. The former Caddy who strives to create better golfers and better people. So Ken, where do you come from, what was life like growing up? My family, while not exactly dirt poor, was definitely working class. I was born and raised in Los Angeles, California and we lived across the street from the Los Angeles International Airport. My dad was an airline mechanic for United Airlines and my mum was a bank teller for Crocker Bank; not exactly the pedigree one thinks of in golfing circles. For me growing up, it was DC 10’s, taking off and landing from across the street, public schools, public golf links and caddying on weekends so I could play the better private golf courses in Los Angeles. How did you end up in Jakarta, what brought you here? I’ve been hooked on Indonesia since 1999. I started in Bali on a surfing vacation. From Bali to Lombok to Sumbawa to Sumatra, I finally came through Jakarta in 2006. I met so many wonderful people living here in Jakarta on that trip, expat and local alike. I was struck by the energy and enthusiasm, especially with the expat community here. I was living in San Francisco at that time, involved in several businesses and doing well, so I thought. Sure I had lots of “stuff” but I quickly learned that people in Jakarta really live. There isn’t a day that goes by in Jakarta, that I don’t see or experience something interesting, wild or crazy. That sort of daily life experience simply wasn’t happening for me any longer back in California and is ultimately what brought me to Jakarta. 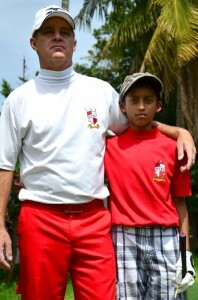 You started out as a caddy and now work at Accel Junior Golf Academy here in Jakarta. How did you make the move from caddy to golf academy? I would say humble beginnings, which I believe has shaped my life in very positive ways. I have worked as a dishwasher, waiter, on a Christmas tree farm, insurance salesman, business owner and many other jobs. Looking back however, it was my experience as a caddy and in golf generally, that I cherish most. I was able to work at Bel Air Country Club under Head Pro Eddie Merrins, “The Little Pro”. Mr. Merrins took the UCLA golf team (with Cory Pavin, Tom Pernise and Duffy Waldorf) to the PAC 10 championship. He is my coach, mentor and dear friend. 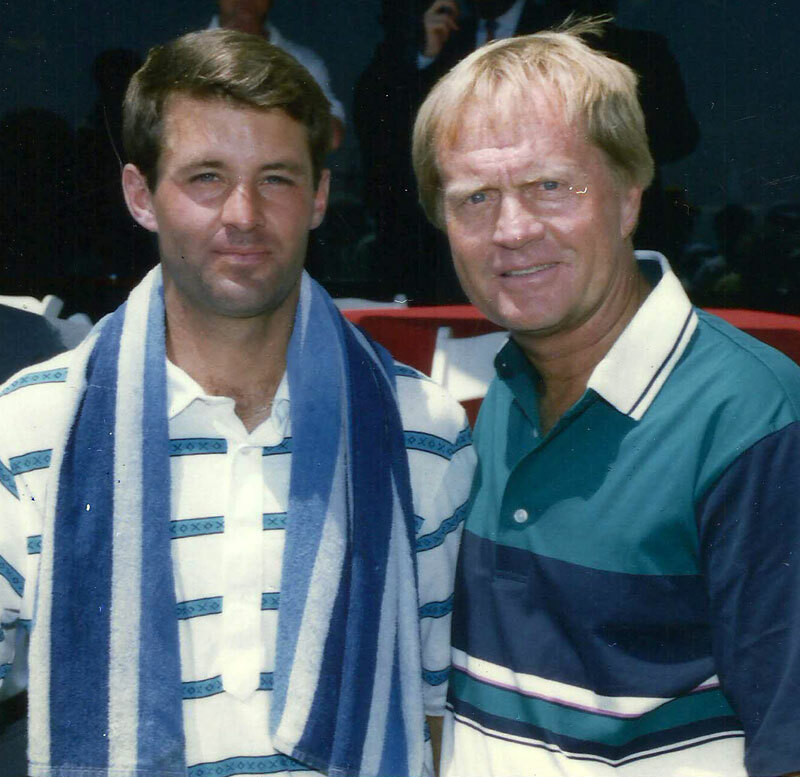 He gave me the opportunity to caddy for Jack Nicklaus and I met a 14 year old kid named Tiger Woods through my association with Mr. Merrins and the Bel Air Country Club. Bel Air and Eddie Merrins are the foundation of my golf experience and the source of my motivation to bring golf to the youth of Jakarta. I was a pretty good caddy back in the day but over the years, I have developed a unique talent in working with kids and making the complex simple to understand. Is there any particular reason you chose to focus on junior golf? Our academy doesn’t exclude adults. We have many adult students; many are the parents of our juniors. Here is the main issue however; golf is not a natural athletic activity. Every natural instinct one has while addressing a golf ball is WRONG. There are no born golfers and literally every touring professional you see on TV was either taught by a teaching professional from an early age or self-taught through many years of hard work, toil and study. I simply find it easier to work with a blank slate as opposed to someone who has developed numerous bad habits over time. Don’t get me wrong, I enjoy working with anyone with a genuine interest in improving their golf swing and golf game. Bad habits can be overcome and anyone, with average athletic ability, can become a competent golfer. What, if any, are some of the challenges in working with junior golfers? For me, trying to teach children to play golf is like a fish trying to learn to swim. I guess I’m just a big kid at heart and it comes naturally working with kids. We focus on both fun and fundamentals. We are also very keen on rules, etiquette and golf values. The challenge is to create better golfers and better people alike. What’s your favourite golf course here in Indonesia? That’s easy, Cilandak Golf Course, a.k.a. Fatmawati. It’s a nine hole institution in Jakarta and a great place to learn for children and adults alike. Sure, the Asian Tour will probably not hold an event at Fatmawati any time soon, but it’s a great place to start for anyone new to the game. Of course Jakarta is blessed with so many world class courses. Are you a self-taught golfer, or did you take lessons? I was lucky to take lessons early on. I couldn’t afford lessons from the likes of Eddie Merrins but because I caddied and worked at Bel Air Country Club, Mr.Merrins would give me free lessons in his spare time. Mr. Merrins’ revolutionary book, “Swing the Handle” is close at hand as I continue to be influenced by his teaching. I‘m also a Ben Hogan fanatic and keep both Hogan books, “Power Golf” and “Five Lessons” under my pillow. I have also worked closely with Tom Bertrand, author of “The Secret of Hogan’s Swing”. Tom had direct access to Hogan secrets via his affiliation with touring professional John Schlee, one of the very few who took private lessons from Hogan. I recommend all three books to any student of the game. I continue to be a student of the game and sometimes the best lessons are the ones I learn from our students. Golf fashion is quite distinct, with lots of bright colours, pastels and plaid. Is there a reason behind the loud outfits? That’s a good question. I guess it all started with Doug Sanders, back in the 60’s and 70’s, and now a tradition carried on today by so many touring professionals. I too, occasionally get loud with hot pink and plaid combinations. There is no accounting for good taste. Besides, what’s so wrong with a coordinated ensemble of golf slacks pressed, matching belt, shined shoes, and ironed collar shirt that is tucked in? I am all for golf fashion. Loud perhaps, but also very tidy. So apart from golf, are there any other sports you enjoy? As I mentioned earlier, I originally came to Indonesia to surf. I’m not very good but I love it. I enjoy dirt bikes and have raced enduro class in the Mojave Desert ala Steve McQueen. Sailing is another passion I left in San Francisco along with my Yamaha dirt bike. My heart, however, is here in Jakarta. What do you enjoy most about living in Indonesia? Easy! All the smiling faces!! Like I said, people really live here. There is always something going on. And for those who complain about the traffic, it’s really not that bad here. Try the 405 freeway in Los Angeles!